One of the best gifts I ever received with my first baby (The Boy), is still in use today and is so great for summer excursions. 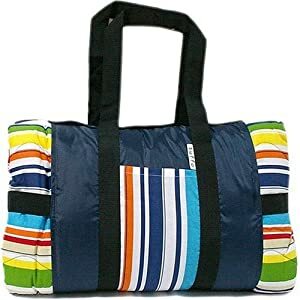 It is the Tuffo Water Resistant Outdoor Blanket with case. It is gorgeous, functional and comfortable. Perfect size. It even comes with us on the plane…to pad the airplane floor the kids sleep on. For trips to the park and to the lake, we love our picnic blanket. The only drawback is that you have to fold it a certain way for it to fit back in the case. Different patterns available at the Safety Superstore ($44.95). Makes for the PERFECT shower/new baby gift. Posted in Cool Products, Gifts.